A safety system for a rotary saw or other dangerous machine tools features a flesh-sensing circuit (14, 19), located on a safety guard (16) surrounding a dangerous machine part, which generates an electronic signal to trigger emergency stopping of the machine before the operator can contact the dangerous machine part. The stopping means preferably employs DC injection, winding current direction reversal and/or electromagnetic motor braking, in the event of detection of operator contact with the safety guarding device. The system is adapted to be used both with newly-manufactured machine tools and by retrofitting onto previously-manufactured machine tools, by in-the-field modifications. 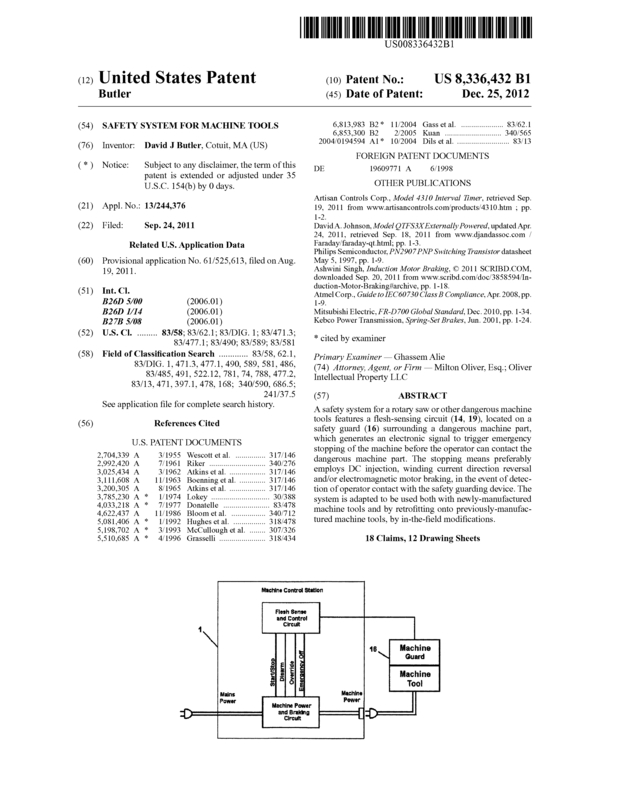 Page created at 2019-04-24 18:17:39, Patent Auction Time.